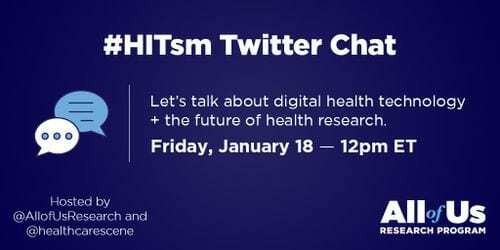 We’re excited to share the topic and questions for this week’s #HITsm chat happening Friday, 1/18 at Noon ET (9 AM PT). This week’s chat will be hosted by the All of Us Research Program (@AllofUsResearch). Joined by experts Chris Lunt, All of Us Chief Technology Officer, Kelly Gebo (@kgebo), All of Us Chief Medical and Scientific Officer, Evan Muse (@EvanMuse), a physician researcher at Scripps Research Translational Institute, and Praduman Jain, CEO of Vibrent Health (@VibrentHealth), we’ll discuss the topic of digital health technology and its role in the future of health research. It’s a new year and a time when people often feel inspired to make a change in their lives. These changes are sometimes reflected in how people approach their overall health and lifestyles, making improved modifications to how they eat, sleep, and exercise. What might not be as widely understood or seen is that these are also changes in an individual’s personal health data, which with today’s technology—our smartphones, wearable devices, and health apps—are data points that can be studied. The All of Us Research Program, a large research program from the National Institutes of Health, is asking one million people to share this type of health information—along with survey responses, electronic medical record information, physical measurements, and blood and urine samples—so researchers may be able to better understand health and disease. Digital health is an important part of the All of Us vision for health data collection. With plans for integrating digital health technology projects into its program in this coming year, All of Us aims to learn more about collecting, curating, and scaling this information for research. Join us for this week’s #HITsm chat where we talk about the intersection between digital health technology and precision medicine.